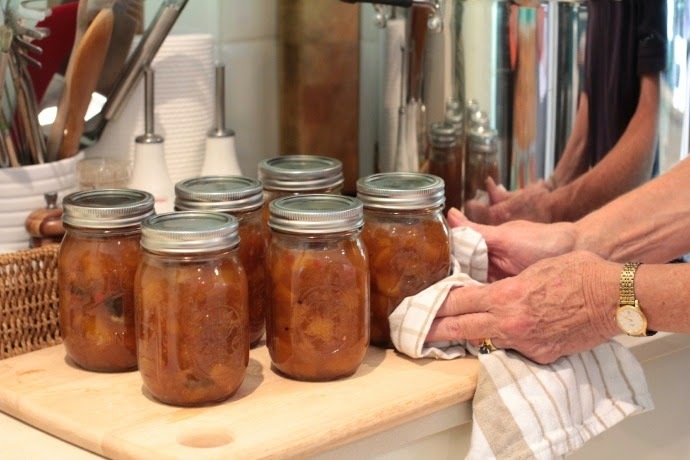 After nearly 50 years married, I never fail to enjoy my wife's jams, pickles and chutneys. 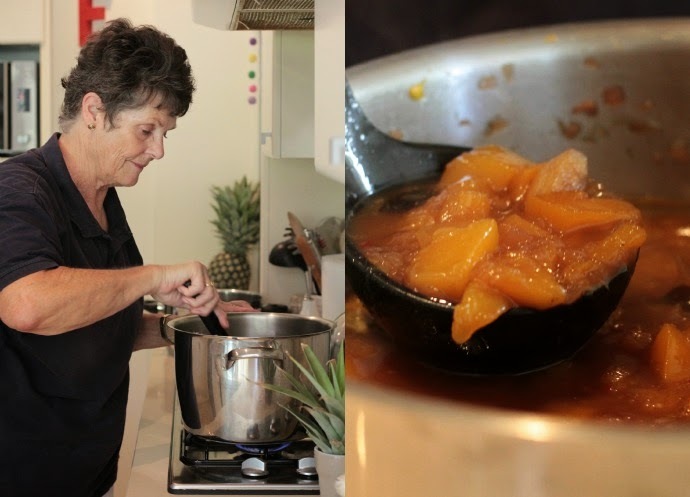 She produces the most wonderful product in spite of using old Vegemite jars and saucepans way too small to do the job properly. I would truly relish (pardon the pun) the chance to give her some wonderful equipment that is designed to do the job efficiently. 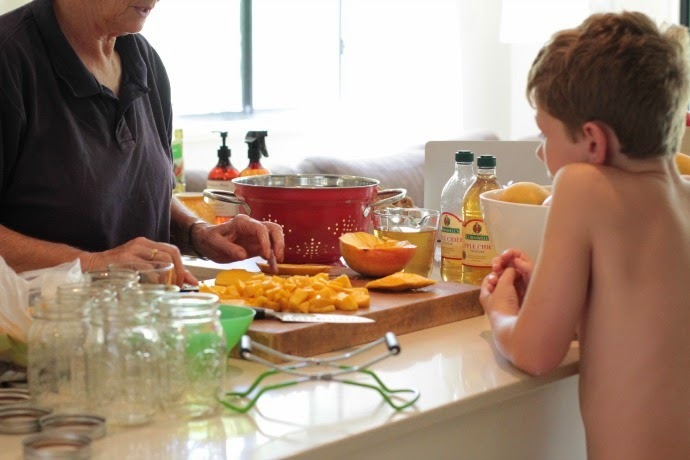 Technically that post title is pretty darn misleading because we made chili mango chutney - and not jam. 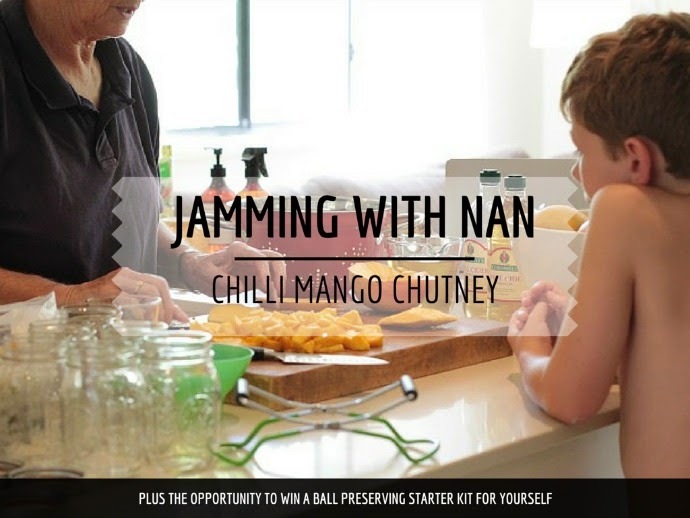 It's just that 'Chutneying with Nan' doesn't really have the same roll off the tongue kind of feel to it so whatever Jamming with Nan it is. I have so many fond memories of spending time with my Nan when I was a little girl. 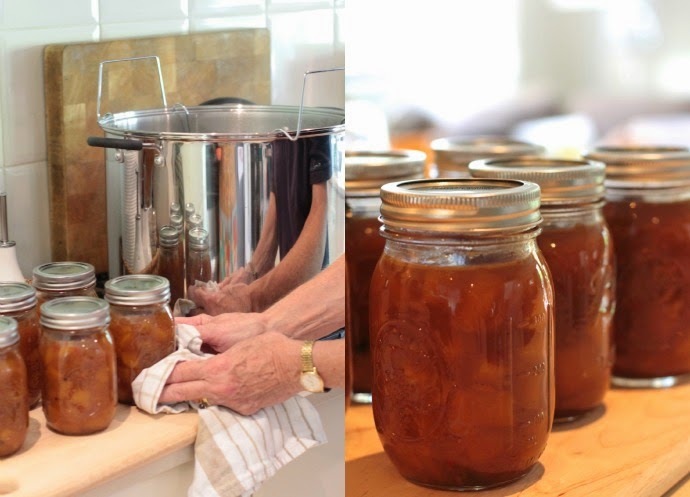 She never taught me how to make chutney though. But that probably had a lot to do with the fact that I had the concentration levels of a goldfish... but regardless, watching her foof around in the kitchen whilst I sat on the bench and ate iced VoVos is very much a precious memory I have of my time with her. 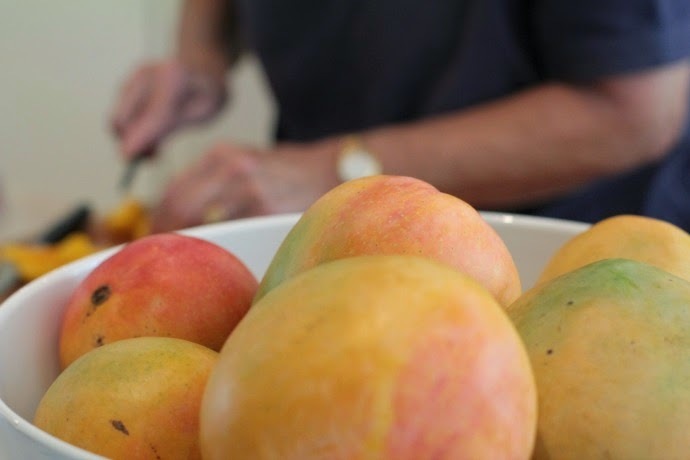 One thing I do remember about my own Nanna was that she was a mango pig. She could tuck away a mango in lightening time with not an ounce of guilt about not sharing it with anyone. 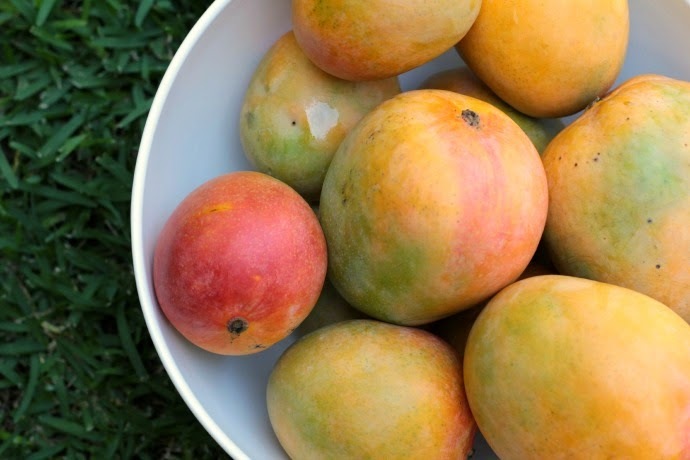 She was shameless and mangoes never fail to make me think of her. I love that my Mum and Dad live literally 2 minutes up the road from us, as it means that they too play a huge part in our boys' lives and the time they spend together will provide the boys with a lifetime of their own precious memories. Alright enough of the nostalgia for today. Today was supposed to be about jamming or yeah OK - 'chutneying'. 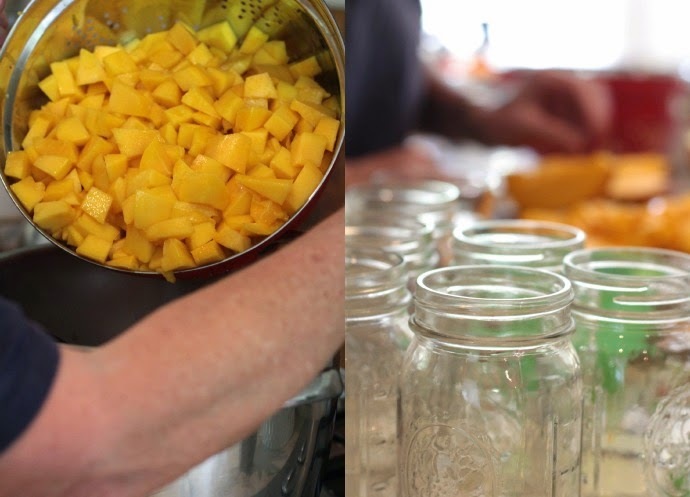 The lovely gang at Ball (the people behind those gorgeous Ball Mason Jars) sent me one of their Deluxe Preserving Starter Kits to try out and so I was super quick to call my mum and say "hey mum - wanna teach me how to make chilli mango chutney?" She was all "yes of course darling" and we spent the day side by side connecting and memory making over a hot stove. But Mum did come over with the intention of teaching me how to make mango chutney... it's just that my concentration levels weren't *cough cough* up to scratch that day and so I *ahem* kind of sat there at the kitchen bench playing on Facebook whilst Sammy who was home sick from school that day set to work on the memory making by chewing her ears off whilst she cooked.. I did help out by stirring the pot every now and then, cause I am really good at pot stirring. 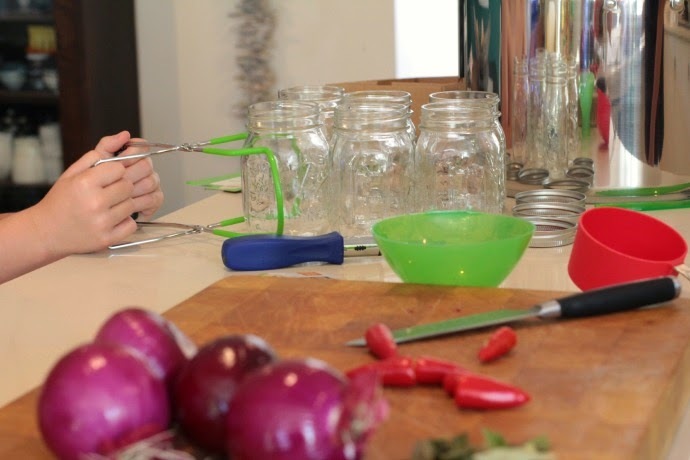 And of course I tasted the ingredients, you know quality control and all that and I even had a go at bottling the chutney because I really wanted to use the cool little gadgety thing that came in the kit to get the sterilised bottles out of the pot. We may have overestimated the quantities because we ended up with a shiteload of chilli mango chutney which I am still dishing out to everyone and anyone that stands still long enough for me to thrust a bottle into their hands. If you are now a proud owner of a bottle of chutney from me - it is an awesome accompaniment with curry puffs. We used the recipe for Chilli Mango Chutney which we got from Taste.com. That website is like the Google of food because you learn how to make pretty much anything from there. Here's the recipe we used if you are keen to get your mum to make it for you too give it a go for yourself. 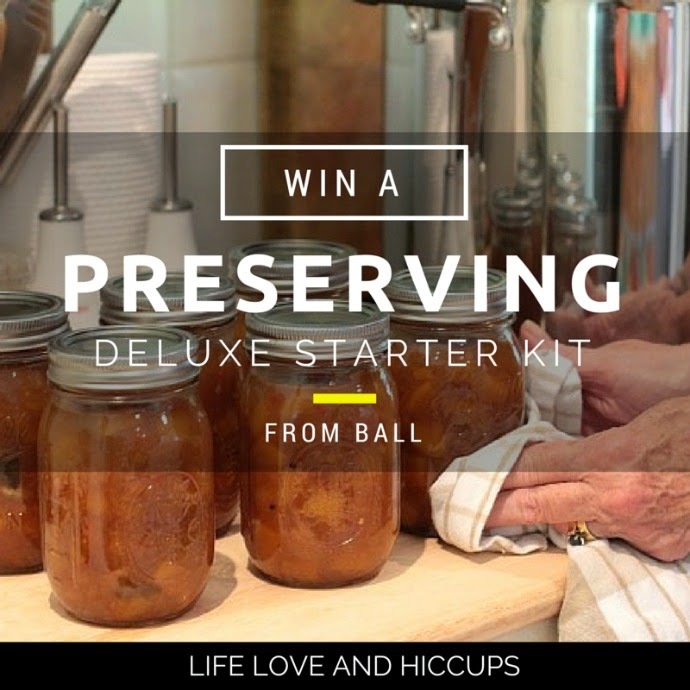 OK now I have one these fabulous Ball Deluxe Preserving Kits to give away to one of you guys so that you too can get Jamming in the kitchen. one of these for yourself? It is open now and closes Sunday 1st March at 7pm AEST. The winner will be contacted via email and announced here on this post. Check out the Ball website or Facebook page for great recipe ideas and tips. ***I was sent a Ball Preserving Kit for the intentions of trialling and also one to giveaway.